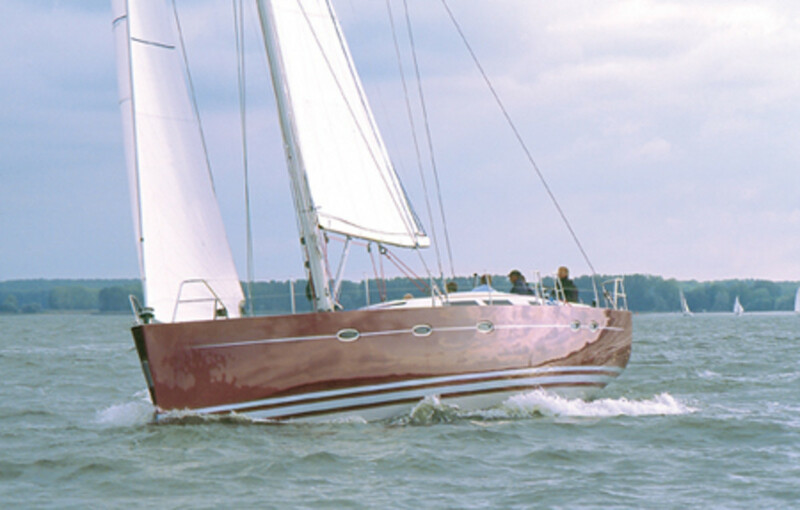 Hanse Yachts in Greifswald, in eastern Germany, was little heard of until the 1990s, when reunification allowed the yard to break into the worldwide production-boat market. Hanse has built fast cruising boats from 31 to 41 feet and recently launched its largest model, the 53-foot 531 that I tested off Cannes, France, this summer. The 531&apos;s deck layout is simple and uncluttered and offers plenty of space for moving about safely when under way. The cockpit is spacious, and twin wheels help maintain the open feel by providing a path to a small aft deck and retractable swim platform. The frame of the cockpit table includes a space to mount a chartplotter/radar screen, and there is an instrument pod above each wheel. All the sail-control lines are neatly led aft under a false deck, and our review boat had Harken 53 electric winches mounted on high coamings just forward of each wheel. The single sheet for the self-tacking jib is led from a car on a semicircular foredeck track, up to a sheave in the mast, back down inside the mast, and eventually into the cockpit. This keeps things tidy; however, it creates a lot of friction and a less-than-ideal sheeting angle when hard on the wind that leaves the foot flapping unless the sail is cranked in hard. The foredeck is wide and almost completely clear of obstructions, thanks to the use of retractable cleats in the bulwarks and a hinged electric anchor roller that emerges out of the anchor locker. The Sparcraft mast and boom are anodized aluminum; the boom is supported by a gas vang. The boat is rigged for easy handling by a couple, and an optional asymmetric gennaker/reacher is available. The standard sails are built by North Sails. The accommodations plan is where the 531 really scores points. It&apos;s a beamy boat, and the accommodations are split into three sections—forward, middle, and aft. Each section has four alternative layouts, so this mix-and-match approach actually offers an enormous choice of interior combinations, plus a further three options in the forepeak—more than any other production boat I know of. For instance, the aft cabin can have a single king-size berth with a single head or with separate toilet and shower compartments. Alternatively, you can choose two smaller aft cabins with twin berths or doubles. The saloon can have an L- or U-shaped galley and three variations of seating, and the forward section can have either another single-/twin-head master suite or two ensuite cabins with double berths. You can also choose between light cherry and darker mahogany joinery. Our test boat had two ensuite aft cabins, a large master suite forward with a single head/shower, an L-shaped galley, and two single armchairs opposite an expandable saloon table. The interior styling is very clean and contemporary, and the mahogany woodwork agreeably complements the stark-white cabintop and bulkheads. With the addition of freestanding chairs, the saloon table can seat up to eight. As with all of Hanse&apos;s boats, the cabin sole is made up from large square panels with no catches or screws holding them in place. Instead, you are supplied with a large suction tool with which to pull up the floorboards. This is great under normal circumstances and means there are no rings or screw heads to catch bare toes on, but chaos might ensue in the event of a knockdown. The nav station has chart stowage in a wide drawer under the full-size chart table, which saves sending the chart and instruments flying every time you want to get out another chart, and there is a huge locker with shelves beside it for pilot books. Opposite is the well-equipped galley. The U-shaped version offers more working area and moves the sink aft. Either way, there is plenty of space to move and sufficient food and drink stowage for a two-to-three-week family cruise. Forward of the saloon is the vast master suite, with a midships king-size berth that can be lifted electrically to reveal a huge lined stowage bin beneath. It is bright and cheerful, thanks to the three hatches and three portlights. The 531 is a big boat for its length. A sail area-displacement ratio of 19.2 indicates the boat should be relatively quick. Performance is enhanced by a long waterline, shallow sections, and low wetted-surface areas. We set off in 7 to 10 knots of true wind and managed a respectable 6.5 knots close-hauled with the jib and full mainsail. The helm is light but not always positive in light air, and I found that the boat wandered off track with any loss of concentration on the helmsman&apos;s part. Later, when the wind increased, the boat displayed noticeable weather helm and became heavier to steer. Easing the main a little helped alleviate this, but didn&apos;t eliminate it altogether. With 15 knots of wind over the deck we hit 7.3 knots when we hardened up, increasing to 9 knots close-reaching and 8.5 knots on a beam reach. As the wind died just before a local storm, we hoisted the gennaker, which kept the speed around 8.5 knots in just 12 knots of true breeze. Off the wind the boat tracked well. Hard on the breeze we tacked through a respectable 78 degrees. Maneuvering under power was easy, especially with the optional bow thruster. The Hanse 531 is unquestionably a comfortable and quick cruising boat that will appeal to those who are looking for spacious and flexible accommodations. It looks gorgeous with its uncluttered decks, steep sheerline, and plumb stem and is unlikely to disappoint in the performance stakes unless you&apos;re expecting to get an out-and-out racing machine.